How can I see which Smart List is associated to which member? I had to do that on a PBCS implementation and as you know there is no access to the backend. Luckily the client named the Smart lists similar to the member names, however there were some which was shared between members!!!! 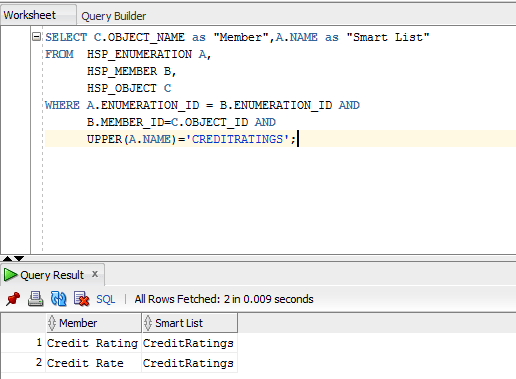 This query will give you the Smart List name along with the members it is assigned to. What if you would like to know which Smart List members are used in which forms, you can run the below given query to get to that. I hope we get the Show Usage for Smart Lists, Menus and member usage in Calc Manager rules in the system. Doesn't the OutlineLoad Utility Web show you the Smart List? Wouldn't that resolve it for PBCS and other (Classic) implementations? Yes, however for that you'll have to extract the metadata using OutlineLoad and then see which members are associated with which Smart List, however it'll still not tell you the association with webform. For that you'll have to run reporting and then scan through a PDF file to see which smartlist members are associated with those. Celvin – Do you know if there a way to pull Smartlist values from Essbase instead of querying the back-end Planning relational tables?